There is nothing better than seeing a child smile and helping them create an unforgettable memory. Last week Gilbert and I visited a local elementary school to create a memorable occasion for the students and to promote the importance of knowledge and learning. To make this an even more memorable talk we brought them a special personalized gift, a Shimmering Star Photo Frame with the children’s names and a special saying, “Shining Star – 2013, Unsworth School” so their family could have a cherished keepsake of their child! It was such a great opportunity to visit these students and bring them a special something that we made and help them understand the importance of learning. We came into the classroom and were introduced by their teacher. We then told them a little bit about ourselves and our jobs and handed out their gifts. The best part of the trip was when we were explaining how their gifts were made. 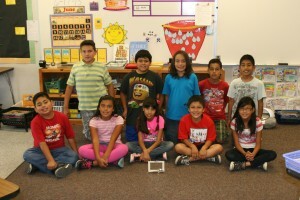 The students’ eyes grew wide with excitement when they heard their picture frames had been engraved with a laser. We saw mouths drop open and heard gasps and it brought a huge smile over both mine and Gilbert’s face. Next we asked them what their favorite subjects in school were and hands shot up to share! Our hearts filled with joy from sharing gifts, stories, and memories with these students!There is nothing better than seeing a smile on a child’s face and knowing you helped put it there! The awesomely sweet Thank You note the kids sent us for visiting!